STOP. CLOSE YOUR EYES AND BREATHE - SLOWLY, DEEPLY. You are standing on the serene shores of a gently rippling lake, surrounded by jungle-clad mountains that are shrouded by the cool morning mist. The air is perfectly pure, the only sounds are the distant calls of birds and monkeys from the forest. Your heart rate slows; you smile. You have arrived. Just as the tranquil waters of our lake reflect the colors of the mountains and sky, the name “atta”, meaning ‘self’ in Sanskrit, reflects the sublime nature of living in this stunning resort. Plan your getaway and enjoy your swing this summer with our special golf package for 2! Stay period from 1 Mar - 31 Oct'19. Relax, escape and thrive with 2 days luxurious Thai & Aromatherapy body treatment at MAYA Spa. Stay period from 1 Mar - 31 Oct'19. Book your green fees this summer on the best golf course and the best prices at Kirimaya. From 1 Apr - 30 Sep'19. Pamper yourself with a relaxing spa treatment in Khao Yai. Enjoy a full range of combo packages that will treat your whole body. Now – 30 Jun’19. Discover our rare special menu in Khao Yai, Red Tailed Catfish with your choice of cooking styles at Acala Restaurant from now – 30 Jun'19. Bottarga is an ingredient made from cured and smoked roe (fish eggs), a perfect addition to a simple dish. Ready to serve now – 30 Jun’19 at MYTH Restaurant. Tarabakani or the red king crab is caught in autumn and winter in cold waters of Japan open sea, and in the North Pacific near to Alaska. You can find it here with your selection menus. Now – 30 Jun’19. Treat yourself to the authentic Northeastern style, hot pot or Isan Jim Joom for dinner. All you can eat is ready to serve every Saturday evening by the pool, only at atta Lakeside Resort Suite. 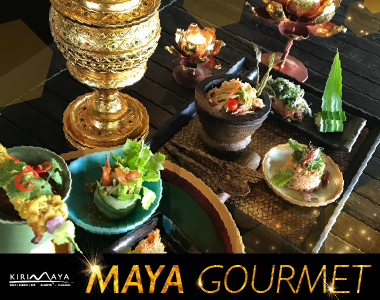 13 Courses Thai degustation dining with contemporary Thai dance shows by local students every Saturday at The Mist, 7-9pm.